MyPay is a platform that consolidates various government agencies, giving users access to services such as status checking, information viewing and also online payments with just their IC number. It is currently in its beta stage and is set to fully launch in late January 2019. Having to pay your fines or loans can be a hassle. That’s just one of the problems that MyPay wants to solve, as paying off any dues to government agencies can be a time-consuming and frustrating process. Although most government agencies are available online now, their websites can be badly developed which can confuse users. 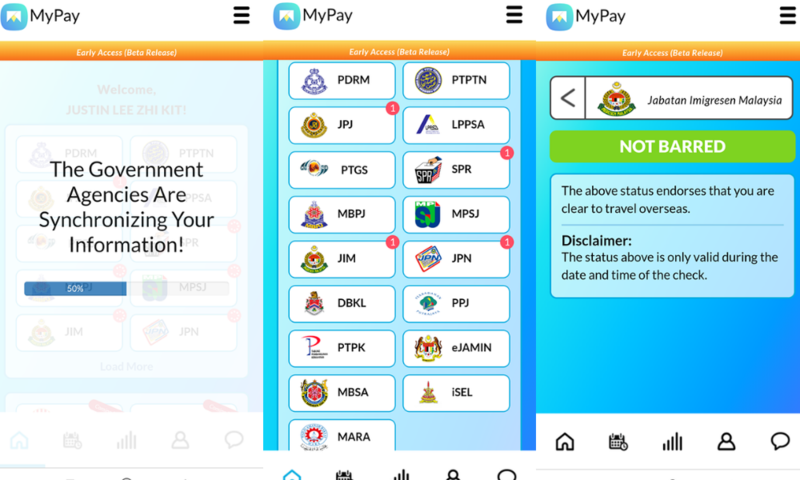 MyPay is a platform where various government agencies are accessible for Malaysians to check their status, view information and also make payments online with just their IC number. A product by Dapat Vista (M) Sdn Bhd, they’re a company which has been involved in government SMS services for the past 10 years. They’re the one’s behind the SMS short code 15888. 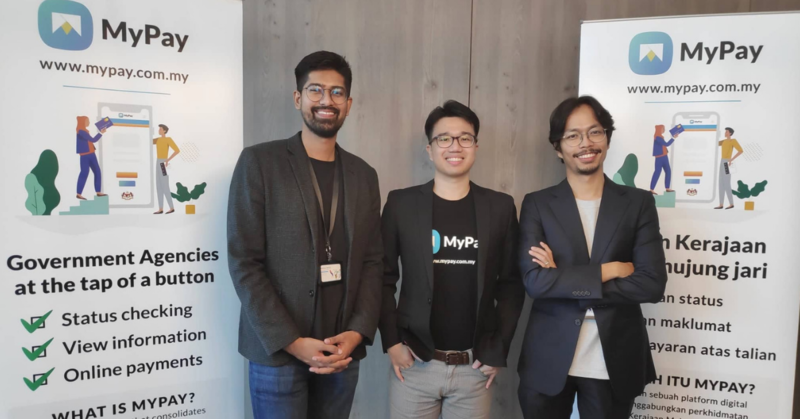 “Because we run that government short code we have a relationship with all 25 ministries across the whole government, that really helps with what we do with our product,” said MyPay CEO, Nick Liew. Left: Shairazi Sulastry, middle: Nick Liew, right: Joshua Smith. Nick Liew has had ten years of experience in business, finance and leadership, starting out his career in one of the Big Four accounting firms—Ernst & Young in London. After returning to Malaysia he founded his own startup to reinvent the Malaysian ridesharing image by educating and empowering public service drivers. With that foundation, he moved on to serve as an early member of the Uber Malaysia team as Head of Strategy and Planning. After that he joined Percetakan Nasional Malaysia and then finally became the CEO of MyPay. He is supported by his co-founder and CTO of MyPay, Joshua Smith, who has a vast background of experience in tech, starting his career with Citibank Malaysia as Management Engineer before moving on to Accenture. In 2015, he moved to Oxford, UK to work with OXIS Energy Ltd and then returned to KL the following year to join Uber Malaysia as Lead of the Analytics Team. Before joining MyPay as CTO, he was the Chief Data Officer at TheLorry. Last but not least, the main team consists of Shairazi Sulastry, or fondly known as GG, who is the Launcher of MyPay. GG is no stranger to entrepreneurship as he has founded three different businesses throughout his career: Kurasa Raksasa, The Secret Service and DEGO. What exactly does a “Launcher” do? At MyPay, GG is responsible for shaping the brand and leading the marketing initiative for the platform. A look at the MyPay platform. The platform is currently still in its beta stage and is set to fully launch late January 2019. As of now the platform has 24 agencies on its platform including PDRM, JPJ, DBKL, PTPTN and more planned in the pipeline. Registering on the platform is fairly simple, you just need to sign up on the MyPay website (currently you can only use the website on your mobile web browser). Insert your IC number and personal details and you can then click on the Agency tabs to see the information, if you notice a notification icon on the agency tab it means your details are included in it. This part can be a bit scary as you might have outstanding summons that have yet to be paid. Luckily I was all clear and didn’t have anything to be worried about. However, security can be an issue here; right now, all you need is the person’s IC number to get access to all the information. Thus, Joshua mentioned that for the full launch, to make the platform more secure, they will be implementing a Know-Your-Customer feature where it’s required to take a picture of your IC and a selfie during the registration process. The closest competitor to MyPay is MyEG, who have been doing something similar for the past 15 years. MyEG had a concession to launch their e-government service platform where no competition was allowed from 2000 till 2015. However it was a blessing in disguise, as MyEG did the hard work of educating the public of using an online platform to settle their summons and such. Nick mentioned that their platform also differs because their user experience is much better and that they’re more citizen-centric. Anyone’s who’s used MyEG before will know that the website can be annoying to use. Firstly you have to always insert a text code when you insert your IC number, and also anyone can put your IC number and see the information tied to it. The services are also limited to a few main agencies unlike those offered on MyPay. “Of course there are other services that MyEG has which we don’t, for example like you want to renew your maid’s foreign worker pass. We don’t touch that, so for that part we don’t compete at all,” said Nick. MyPay targets five main areas of government agencies: information, student loans, summons, taxes and insolvency. The platform is free to use and MyPay monetises by charging a certain fee for each transaction. “So when people pay for student loans or summons, we will charge 50sen-RM1 per transaction. It’s a flat fee and it’s according to the guidelines set by the government,” added Nick. He also compared it to other companies that do something similar that charge 1-2% for each transaction. 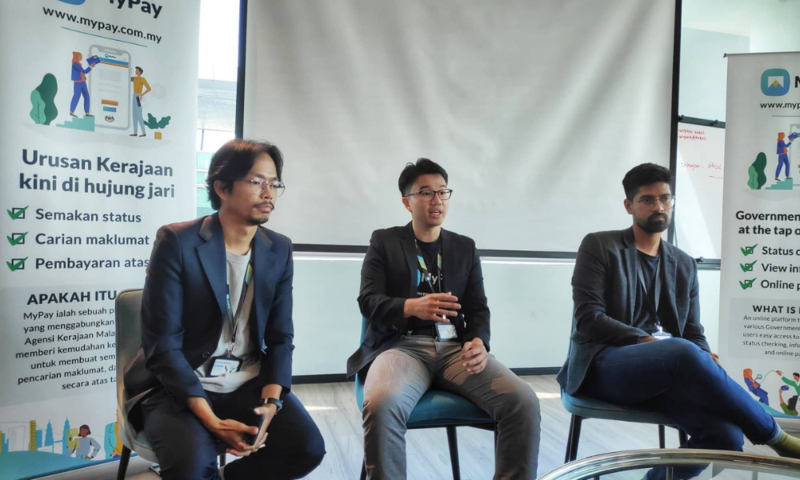 Currently, MyPay will be targeting the Malaysian public first for 1-2 years, before going on to commercial services such as billing before planning for foreign expansion and other forms of monetisation. They are currently still in closed beta and will fully launch in late January 2019. You can visit the MyPay website here.